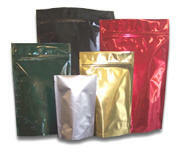 We make a full line of stock bags to accommodate most coffee roasts, and products sensitive to water-vapor and oxygen. 5 lb. Silver bags are available in both wide and narrow! Many of our bags feature ãEasy-Peelä film for consumer convenience. Our large bags - 20# and 40# - are great for any bulk products including dry pet food, resins, chemicals and other industrial products.